The Responsible Use of Medicines in Agriculture Alliance (RUMA) was invited by the Science Media Centre to comment on an article in today’s Lancet Infectious Disease. The article reported that a new gene that makes common bacteria resistant to colistin, a last-line antibiotic, had been found in animals and patients in China. John FitzGerald, RUMA Secretary General, said that David Burch a veterinarian, specialist in pig medicine, consultant to the animal health industry and independent RUMA member provided the following statement on behalf of RUMA. “The report of a new resistance gene (mcr-1) against polymixins (colistin) found in Escherichia coli from pigs in China, which can be potentially plasmid transferred between bacterial species and potentially to man via meat, is indeed disturbing and disappointing. Formerly, colistin resistance both in man and animals was thought to be chromosomally related and therefore unlikely to be transferred. It is noted that most of the genetic work was carried out on a plasmid basis and not on the resistance gene itself, so the final link between pigs, pork, man and human disease has not been completely established. Recent work looking at attribution of extended-spectrum beta lactamase resistance from food to man has shown that man to man is the major contributor (99.74%: 0.26%) (Burch, 2015) due to hospital and care facility spread of bacteria carrying the resistance genes. Further genetic work is required to confirm the direct linkage between food and man with the mcr-1 gene. So saying, it must be remembered that China has the largest pig production in the World over twice that of Europe’s, they are major producers of generic antimicrobial drugs and their use in animals is not normally under veterinary control. Fortunately, the supply of live pigs and pork is in the direction from Europe to China and due to the nature of the endemic diseases in China, such as Foot and Mouth Disease, it is unlikely that this will be reversed. The possibility of transfer by man, however, is a more likely risk with increased trade and tourism between the two regions of the World. This is a good example of the complexity and global nature of antibiotic resistance and the need for countries to work together to address this One Health issue. In the response to the European Commission by the European Medicines Agency (2013) regarding the use of old classes of antibiotics, like colistin, which have been re-introduced to treat multi-resistant bacteria in humans they recommended: – “Despite the abundant use of colistin in veterinary medicine for over 50 years, from the available information colistin resistance transmission via horizontal gene transfer or sustained clonal expansion has not been observed for the target Gram-negative organisms. However the rapid emergence of resistance in humans after oral use in the Intensive Care Unit (ICU) for selective digestive tract decontamination shows that resistance in Enterobacteriaceae can emerge following oral use. The lack of emergence of resistance should be addressed with caution since in depth epidemiological surveys in veterinary medicine are scarce. Large studies combining consumption and resistance are limited, because colistin susceptibility tests are not fully reliable. Burch, D.G.S. (2015) Use of antibiotics in animals and people. Veterinary Record, 177, 11, 292-293. EMA (2013) European Medicines Agency – Answer to the first request from the European Commission for scientific advice on the impact on public health and animal health of the use of antibiotics in animals. EMA/363834/2013. ESVAC (2015) European Medicines Agency – Fifth ESVAC report – Sales of veterinary antimicrobial agents in 26 EU/EAA countries in 2013. The Responsible Use of Medicines in Agriculture Alliance (RUMA) is delighted to support European Antibiotic Awareness Day on 18 November. RUMA Secretary General, John FitzGerald, said he was pleased to see RUMA members such as the BVA and NFU using antibiotic awareness day to provide information on the responsible use of antibiotics which are key medicines in both human and animal health. Responsible use of antibiotics in livestock helps to maintain animal health and welfare and provide safe food for the consumer. Antibiotics should not be used as a substitute for good farm management which helps prevent disease and reduce the need for medicines. Antibiotic Awareness Day provides an ideal opportunity for everyone to confirm their support for using antibiotics responsibly by signing the pledge to become an antibiotic guardian at antibioticguardian.com. 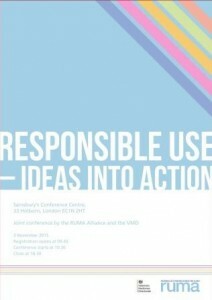 “There are pledges relevant for everyone, to show how they, personally, can support responsible use,” explained Mr FitzGerald. “As well as those aimed at the medical profession and the public, there are specific pledges for veterinarians, farmers and indeed pet owners too.” Mr FitzGerald added that he has taken the pledge and he encourages others to do so. The Responsible Use of Medicines in Agriculture Alliance (RUMA) is delighted to be hosting today with the Veterinary Medicines Directorate (VMD) the first joint conference on the responsible use of medicines in animals. It is an excellent example of industry and government working together to help veterinarians and farmers use medicines responsibly and to tackle the serious health risks caused by antibiotic resistance. John FitzGerald, RUMA General Secretary, said “there has been much mention of responsible medicine use in both human and animal sectors and this One Health Conference aims to take this a stage further by investigating how we can turn “Ideas into Action”. 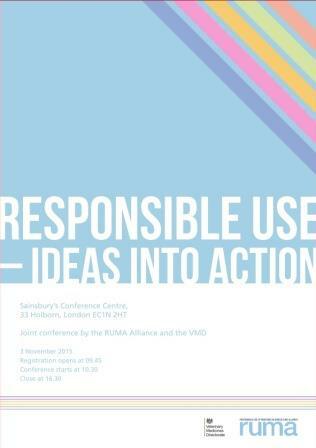 RUMA and the VMD will issue a joint communication following the conference to highlight its key messages. 2. VMD (an Executive Agency of Defra) is the UK regulator of veterinary medicines assuring their safety, quality and effectiveness. For further information about the VMD contact Matthew Isted at m.isted@vmd.defra.gsi.gov.uk or search for the VMD on www.gov.uk. 3. RUMA and the VMD are very grateful for the generous support from Sainsbury’s who have provided the venue and all catering free of charge.